From 16th to 20th February in Andalusia, Spain, following the VIIth Conference in the Basque Country last July, the member organisations of La Via Campesina met to work on the common strategies and tactics of the peasantry to tackle the global challenges that they face. This evaluation and planning took place in Andalusia, as it is an historic stronghold for peasant struggles. It holds the seat for SOC-SAT (Sindicato de Obreros del Campo –Sindicato Andaluz de Trabajadores), who are at the forefront of the fight to protect day-laborers and for land redistribution regionally. “In Andalusia, we are fighting for a comprehensive agrarian reform to ensure that our peasants are no longer denied their right to work the land and to allow the fertile Andalusian earth to bear its fruits. This is why our fight, La Via Campesina’s fight, is necessary, especially when faced with capitalism’s voracious appetite. We are brothers and sisters united in a struggle for a better world, aspiring towards a healthy and just society where there is respect for the dignity of men and women” stated Oscar Reina, national spokesperson for SOC-SAT, before the international delegation. 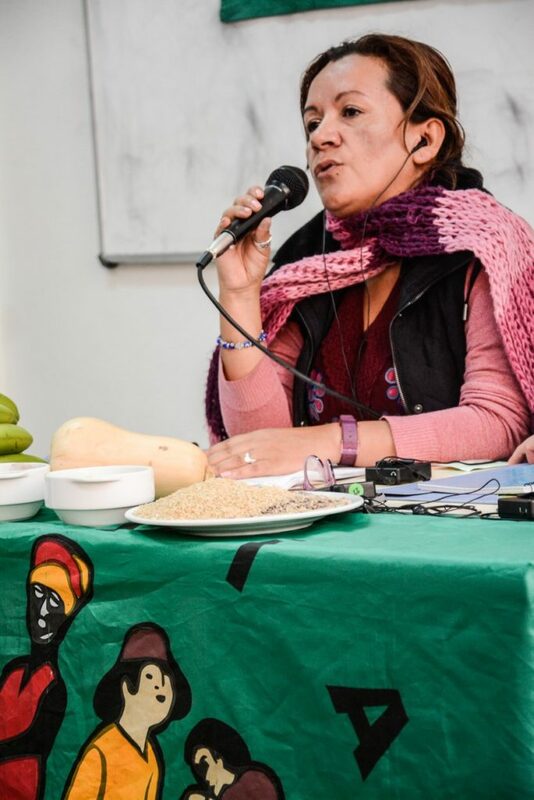 Over the course of four days, the seminar of the working-collectives of La Via Campesina, looked at ways to further the analysis of the situation and of the challenges currently faced by La Via Campesina. “We are here because the very essence of La Via Campesina is the fight for land. Contrary to the way in which governments and institutions manage land, we fight for a complete agrarian reform that is for the people, because therein lies food sovereignty and peasant agroecology. In this sense, the work that the collective does is essential to champion these and other rights. Agrarian reform is an undertaking that was abandoned by the capitalist production model. In the initial accumulation of capital, it was thought that capitalism was going to solve problems in the countryside, particularly problems such as the ownership of land. However, over the past years, the situation has gone from bad to worse. Today, issues such as land grabbing, extractivism, big mega projects and agribusiness are the main threats to the peasantry”, stated Zainal Arifin from the Indonesian Peasant Union (SPI). On the same day, an analysis was shared of the current global socio-political climate which took into consideration the privatisations, political coups and struggles that are taking place across different countries. A discussion was held on the agricultural model and the assault carried out by big businesses. Members of Via Campesina, representing various continents, explained how they resist against this model that brings death and waste. Furthermore, the main threats to natural resources, such as the earth, water, seeds, which in turn threaten food sovereignty were also analysed. Feminism and the fight against patriarchy were also highlighted as a political priority for the future in order to create new relationships between the genders and a new social project. 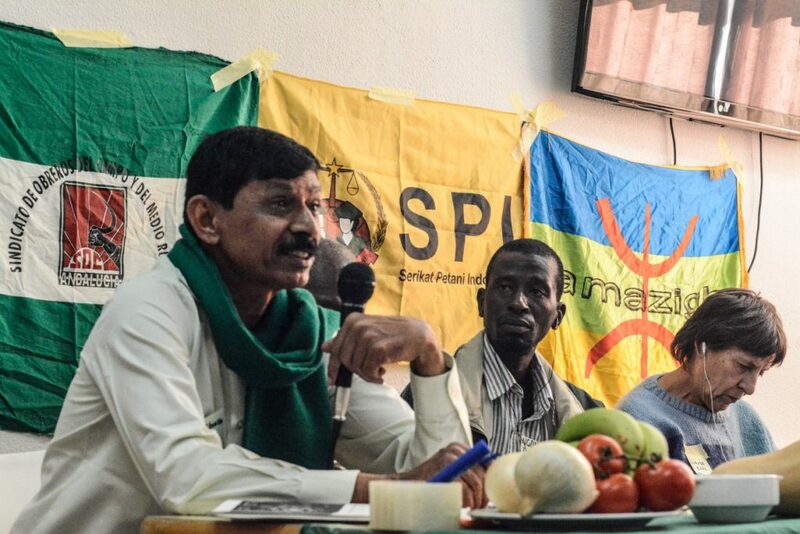 The struggle for Sovereignty and peasant agroecology, cross-cutting issues touching the various work collectives, were emphasised during the seminar by Guy Kastler from the Confédération Paysanne (France). “At the moment, both the capitalist system as well as the global governance system are collapsing. It is no longer the governments that govern but the transnational corporations. Country after country is falling apart. There are also people living in war zones and in countries that are in danger of hurricanes where harvests are lost. All these people are excluded and are currently living this downfall. When a system collapses, you must not stand under it. A major strength of La Via is the promotion of an alternative known as food sovereignty, based on an agroecological production model. Today, we call this Peasant Agroecology, because now the corporate sector also uses the term “agroecology”. Throughout the seminar, the organisation of the work collectives was regularly discussed, in order to develop coordination methodologies and ways to share out tasks that ensure mass actions and to carry out the struggles from the different territories, both on a national and international level. Another point highlighted was the alliances between the working classes in the countryside and in the city. The need for unity and solidarity was emphasized. La Via Campesina’s work collective seminar finished with some visits to the countryside where the participants got to see concrete experiences of cooperative work and land occupations in Andalusia, such as in Somonte in Palma del Rio (Córdoba), Marinaleda (Sevilla) and Cerro Libertad (Jaén). In 2012, the estate of Somonte, which belongs to the Regional Government of Andalusia, was occupied by peasant workers from the Andalusian Workers Union in light of the possibility that it would be auctioned off and privatised. Since then, the workers have been able to recover traditional varieties of wheat. Conversely, Cerro Libertad covers 75 hectares of olive groves which belong to the bank BBVA. It has been occupied since April 2017 and on 19th March 2018 there will be an attempt to evict the occupants. Look out, look out! La Via Campesina’s fight to protect Life is marching on!